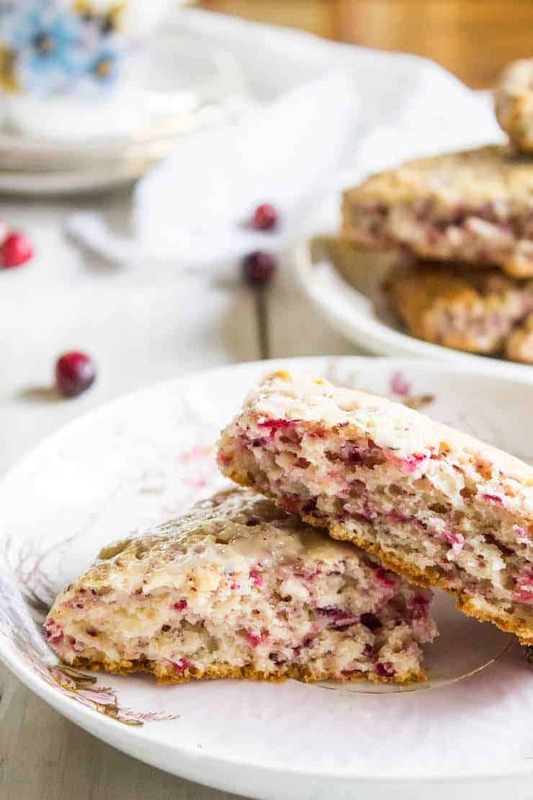 Cranberry scones are perfect for breakfast or a midday break. 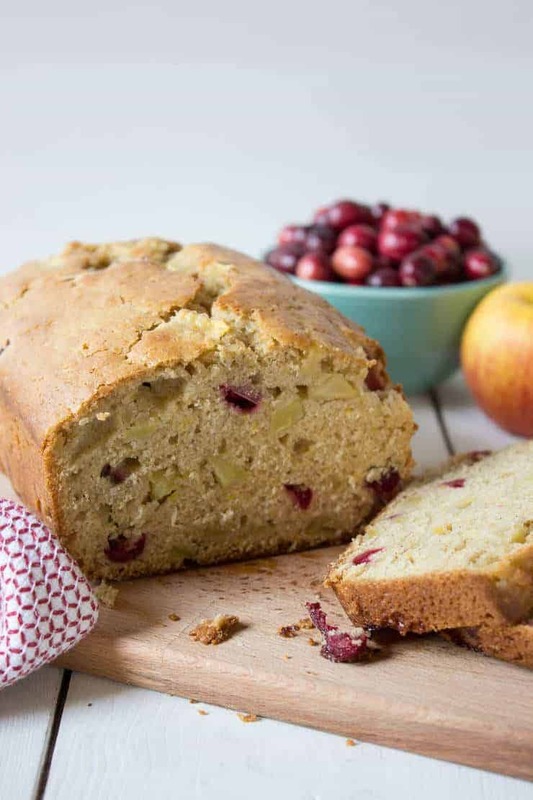 Oh my goodness…..cranberry season is in full swing! I always buy fresh berries and bake up a bundle. But I also throw a few bags directly into the freezer to use when fresh cranberries are no longer available. Fresh is the best, but frozen berries come in a close second. This year I have gone a bit crazy with fresh cranberries. I have bought a few bags every time I’ve gone to the store. I’ve made cranberry sauce for Thanksgiving, cranberry nut bars and cranberry apple bread. Every time I open the fridge, there are more cranberries just waiting to be used. I decided it was time to make cranberry scones. To make these a bit more delicate, I’ve finely chopped the cranberries. I mixed these scones in my food processor. It makes making scones pretty darned easy. 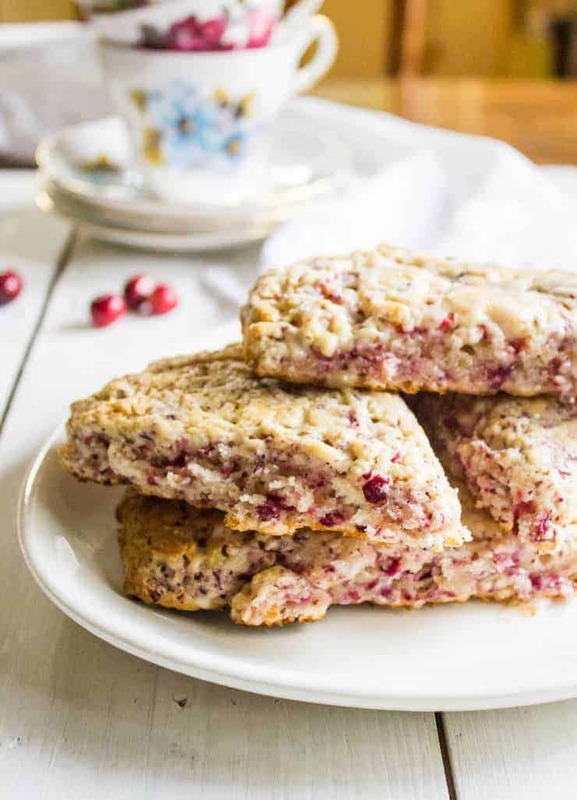 Cranberry scones for breakfast or for a mid-morning snack is a perfect treat! 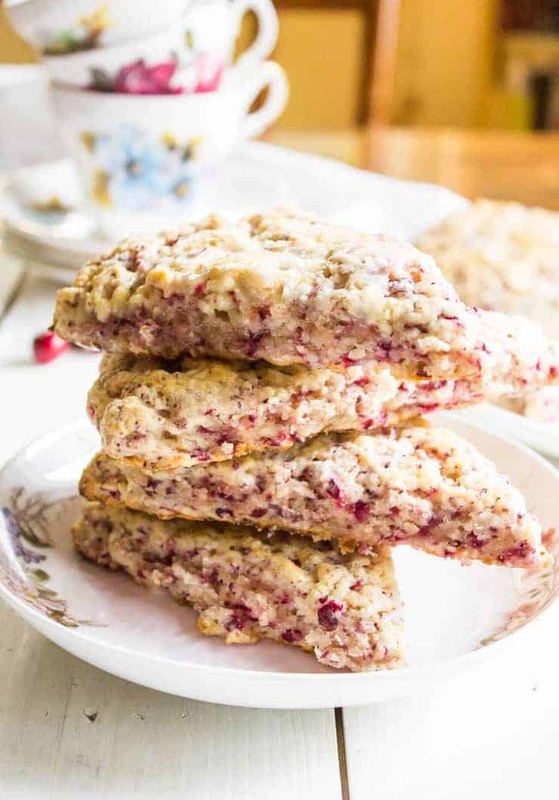 Scones made with fresh cranberries. 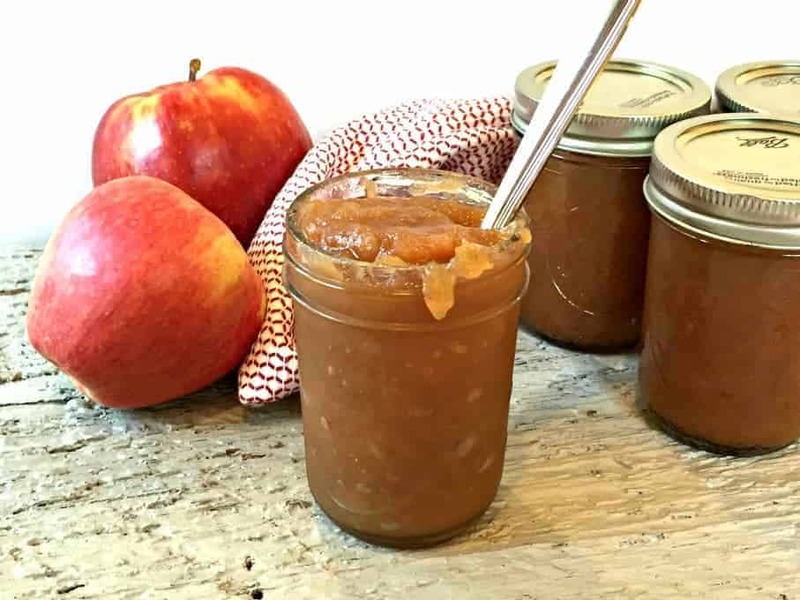 2 Tablespoons Cream for brushing on scones. Place flour, butter, baking powder, 1/4 cup sugar and salt into a food processor. Pulse until mixture is crumbly. Add cranberries. Pulse until cranberries are chopped. Add 3/4 cup cream. Mix for 15 seconds. Add additional 2 Tablespoons of cream, if needed. Mix 15 seconds or until forms a ball of dough. Remove from food processor onto a lightly floured surface. Knead 3-4 times making certain everything is well mixed. Form into a large circle, leaving dough about 1 1/2" high. Bake in a preheated 425 degree oven for 20-22 minutes. While still warm, mix glaze. Mix 2/3 cup powdered sugar and orange juice, or milk in a bowl. Drizzle glaze over scones. Kathy, these scones look AMAZING! 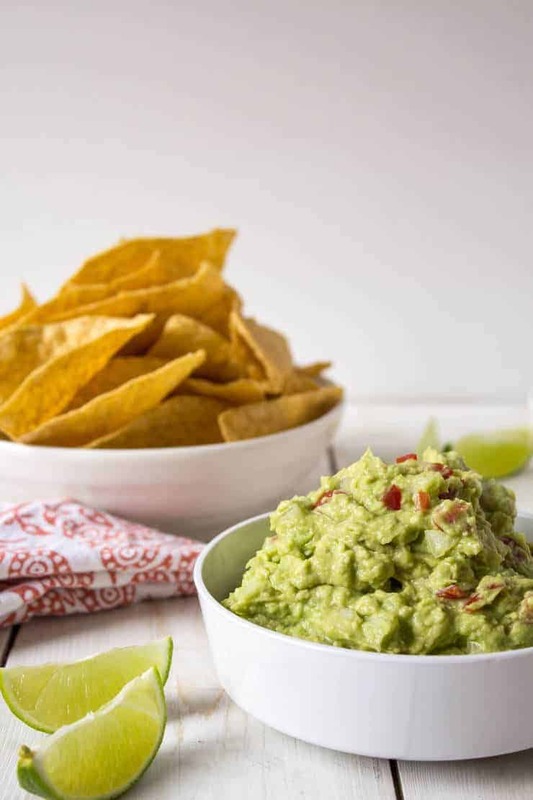 I can’t wait to make these for my Christmas entertaining. I’ve gone cranberry crazy too this year! I made something similar last week and added white chocolate to them. I bet your recipe would be really good with white chocolate as well. Everything is really good with chocolate! White chocolate would go perfectly in these scones. Thanks for the suggestion! This would make the perfect Christmas morning breaking! Not too sweet and of course with a cuppa tea! Usually, we have chocolate for breakfast but that probably isn’t the best idea! hehe. I love cranberry scones, but confess, I have never actually made them myself. 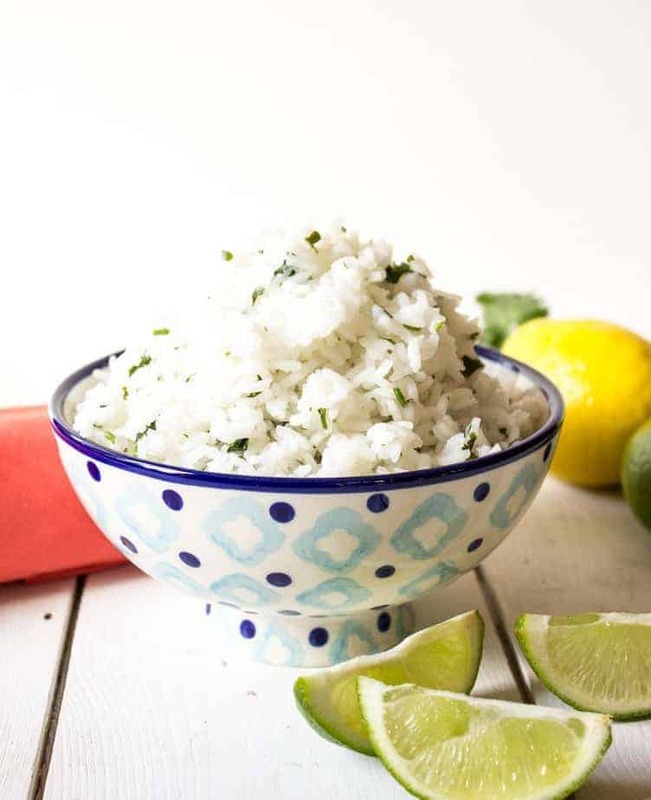 This recipe, and these amazing photos are about to change that! 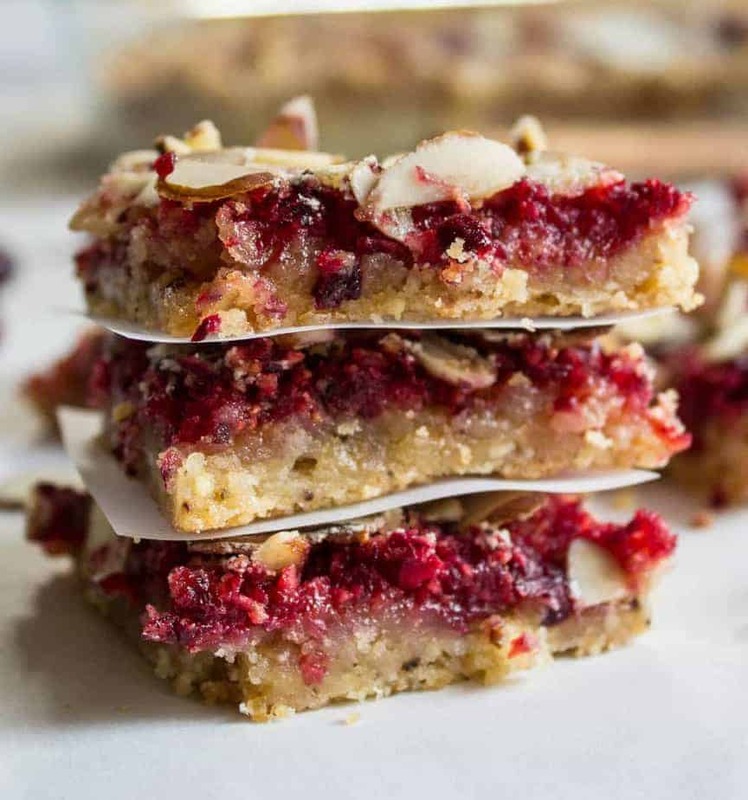 We are getting really excited to start cooking and baking with cranberries here too! We will be starting this week in preparation for our Thanksgiving celebration in Paris! I am so tempted by your cranberry scones and can’t wait to try them. We have never actually made scones before! Happy Thanksgiving! I love cranberries, too! I have two bags waiting to be used and scones would be the perfect option! Can you believe I just bought two more bags??? Time for some more baking! We’ve bought a lot of fresh cranberries too this season. Some are still in the fridge and I was thinking of making scones, so thanks for the push 😉 . They look wonderful! Time to get baking! 🙂 These scones are just waiting to be made! 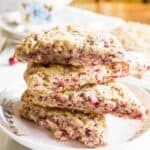 I love scones and your cranberry version sounds delicious! They are so colorful and pretty! 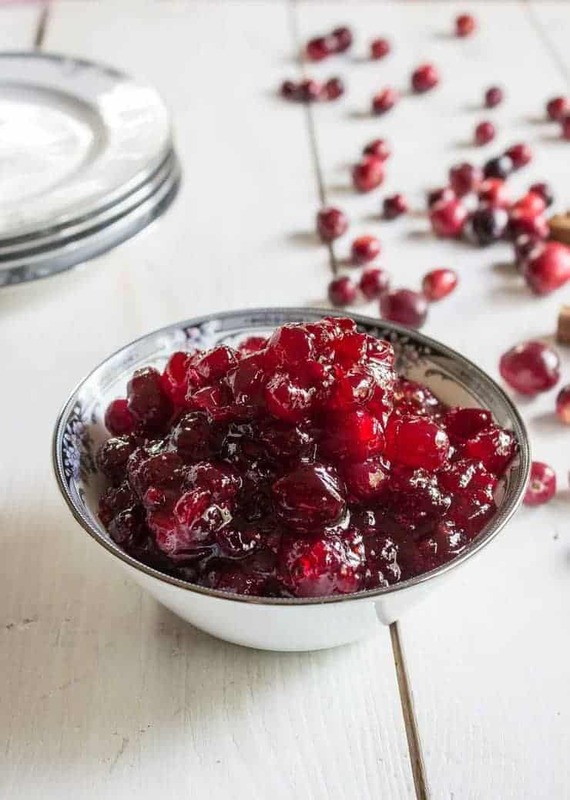 I love the tartness and love cranberries in just about everything! Oh man, I love a good scone! They are the perfect treat…especially when served on a cold day with a hot cup of coffee. I could totally get behind having a batch of these hanging out on my countertop right about now. Love the cranberries in this version, too…perfect for Thanksgiving! They disappear quickly when they are just sitting around. I’m not sure who ate them all in my house…but boom, they were gone! Wow! Do I love all the cranberry loading up these gorgeous scones! I’m a huge fan of scones and tea…this will most certainly be added to my repertoire!! Thank you for sharing! They go perfectly with a nice cup of tea! Dear Kathy, I love homemade scones. They are the best. And cranberry! Delicious. Your cranberry scones remind me of when we were kids and went to Edaville Railroad in Carver, MA every year to ride the train through the cranberry bogs. They have special Christmas programs too, with thousands of lights strung all around. Such a beautiful setting and cranberries are the best. Will def. 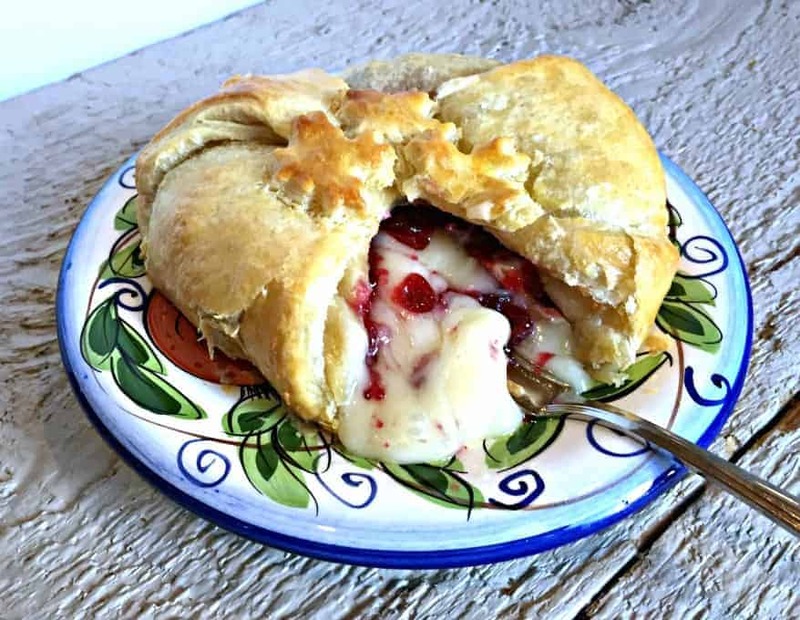 have to try your cranberry scones over the holidays. Happy Thanksgiving to you and your family! I would love to visit cranberry bogs. I would love to see their beauty! Happy Thanksgiving to you too! I’m a huge scone lover Kathy, so I will definitely be adding these to my scones list. They look delicious! 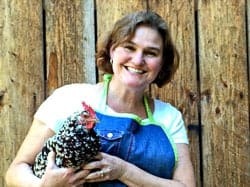 Thanks, Maryann! I love scones too. 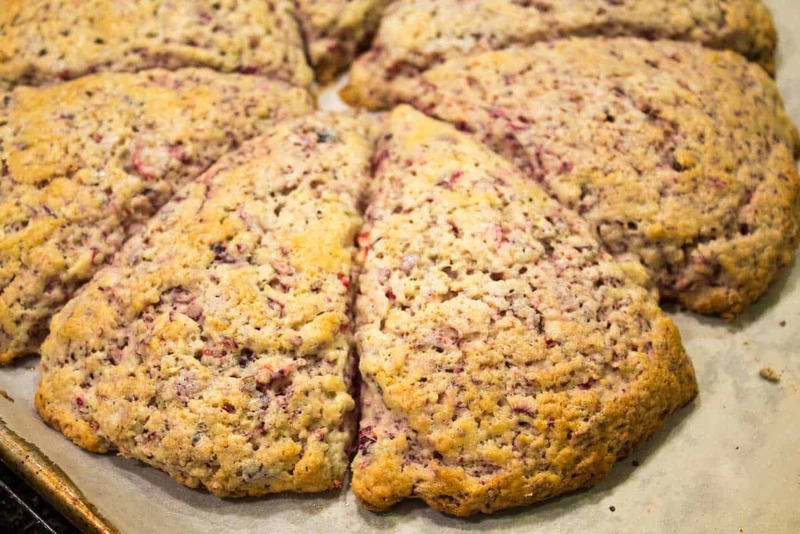 Cranberry scones are a great way to start the day! Directions did not add the 2/3 cup of sugar so I added in with the flour, salt, butter, etc. Just thought you should know. They are very good, thanks for the recipe and I think I might add some OJ into the mix too when I make again.